Most Americans will never be able to afford to retire. Companies were eager to get this expanding liability off of their backs. And the more poorly-capitalized firms started defaulting on their pensions, stiffing those who had loyally worked for them. So, it’s little surprise that the 1970s and ’80s saw the introduction of personal retirement savings plans. The Individual Retirement Arrangement (IRA) was formed by the Employee Retirement Income Security Act (ERISA) in 1974. And the first 401k plan was created in 1980. These savings vehicles are defined contribution plans. The future payout of the plan is variable (i.e., unknown today), and will be largely a function of how much of their income the worker directs into the fund over their career, as well as the market return on the fund’s investments. Touted as a revolutionary improvement for the worker, these plans promised to give the individual power over his/her own financial destiny. No longer would it be dictated by their employer. Your company doesn’t offer a pension? No worries: open an IRA and create your own personal pension fund. Afraid your employer might mismanage your pension fund? A 401k removes that risk. You decide how your retirement money is invested. Want to retire sooner? Just increase the percent of your annual income contributions. All this sounded pretty good to workers. But it sounded GREAT to their employers. Why? Because it transferred the burden of retirement funding away from the company and onto its employees. 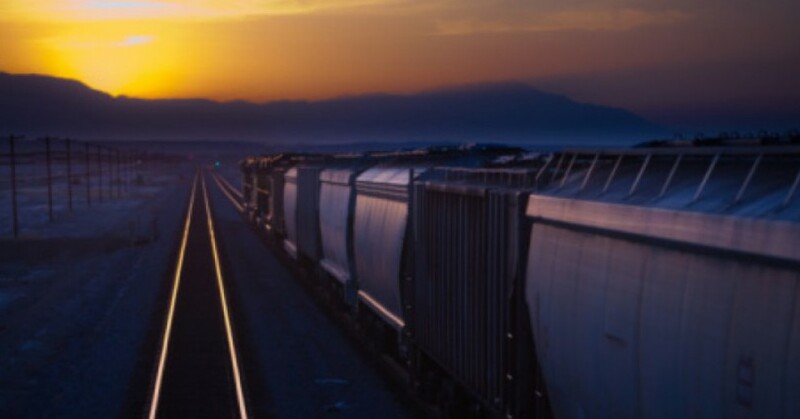 It allowed for the removal of a massive and fast-growing liability off of the corporate balance sheet, and materially improved the outlook for future earnings and cash flow. 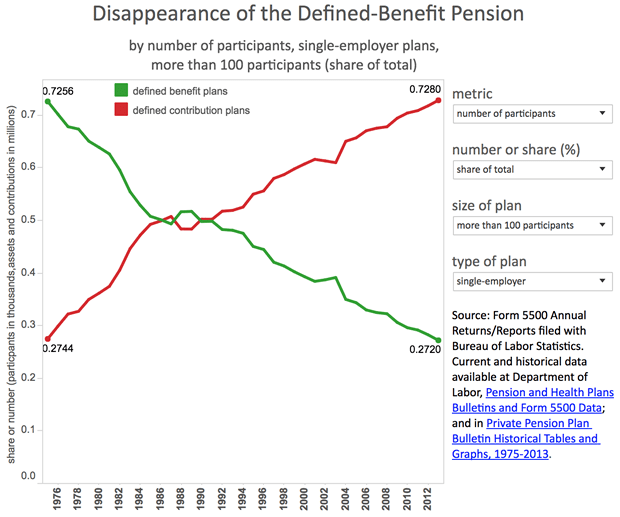 As you would expect given this, corporate America moved swiftly over the next several decades to cap pension participation and transition to defined contribution plans. So, to recap: 40 years ago, a grand experiment was embarked upon. One that promised US workers: Using these new defined contribution vehicles, you’ll be better off when you reach retirement age. Which raises a simple but very important question: How have things worked out? Well, things haven’t worked out too well. Four decades later, what we’re realizing is that this shift from dedicated-contribution pension plans to voluntary private savings was a grand experiment with no assurances. Corporations definitely benefited, as they could redeploy capital to expansion or bottom line profits. But employees? The data certainly seems to show that the experiment did not take human nature into account enough – specifically, the fact that just because people have the option to save money for later use doesn’t mean that they actually will. And so we end up with the dismal retirement stats bulleted above. In our recent report The Primacy Of Income, we summarized our years-long predictions of a coming painful market correction followed by a prolonged era of no capital gains across equities, bond and real estate. Simply put: the ‘easy’ gains made over the past 8 years as the central banks did their utmost to inflate asset prices is over. Asset appreciation is going to be a lot harder to come by in the future. Which makes income now the prime source of building — or simply just maintaining — wealth going forward. That being the case, it’s obvious that those receiving a pension will be in far better shape than those who aren’t. They’ll have a guaranteed income stream to partially or fully fund their retirement. While the total number of people expecting a pension isn’t tiny, it’s certainly a minority of today’s workers. 31 million private-sector, state and local government workers in the US participate in a pension plan. 3.3 million currently-employed civilian Federal workers will receive a pension; as will some percentage of the 2 million people serving in the active military and reserves. Combined, that’s about 25% of current US workers; roughly 13% of total US adults. Now that the Everything Bubble is bursting and a return to economic recession appears increasingly probable within the next year or two, the disparity in prospects between these 35 million future pensioners and the rest of the workforce will become increasingly obvious. The danger here is of festering social discord. The majority, whom we already know will not be able to retire, will highly likely start regarding pensioners with envy and resentment. “Hey, I worked as hard as Joe during my career. How come he gets to retire and I don’t?” will be a common narrative running in the minds of those jealous of their neighbors. So it’s not a stretch at all to predict the divisive tension and prejudice that will result from the growing gap between the pension haves and have-nots. The steady news reports of pension fraud and abuse will anger the majority further. Any projected decreases in Social Security (benefit payouts will only be 79 cents on the dollar by 2035 at our current trajectory) will only exacerbate the ire, as the small governmental income the have-nots receive becomes even more meager. The growing potential here is for an emerging social schism, possibly accompanied with intimidation and violence, not dissimilar to that which has occurred along racial or religious lines during darker eras of our history. As people become stressed, they react emotionally, and look for a culprit to blame. And as they become more desperate, as many elderly workers with no savings often do, they’ll resort to more desperate measures. And it’s not all sunshine and roses for the pensioners, either. Being promised a pension and actually receiving one are two very different things. Underfunded pension liabilities are a massive ticking time bomb, certain to explode over the next few decades. For example, many pensions offered through multi-employer plans are bad shape. The multiemployer branch of the Pension Benefit Guaranty Corporation, the federally-instated insurer behind private pensions, will be out of business by 2025 if no changes in law are made to help. If that happens, retirees in those plans will get only 10% of what they were promised. Moreover, research conducted by the Pew Charitable Trusts shows a $1.4 trillion shortfall between state pension assets and guarantees to employees. There are only two ways a gap that big gets addressed: massive tax hikes or massive benefit cuts. The likeliest outcome will be a combination of both. So, many of those today counting on a pension tomorrow may find themselves in a similar boat to their pension-less neighbors. 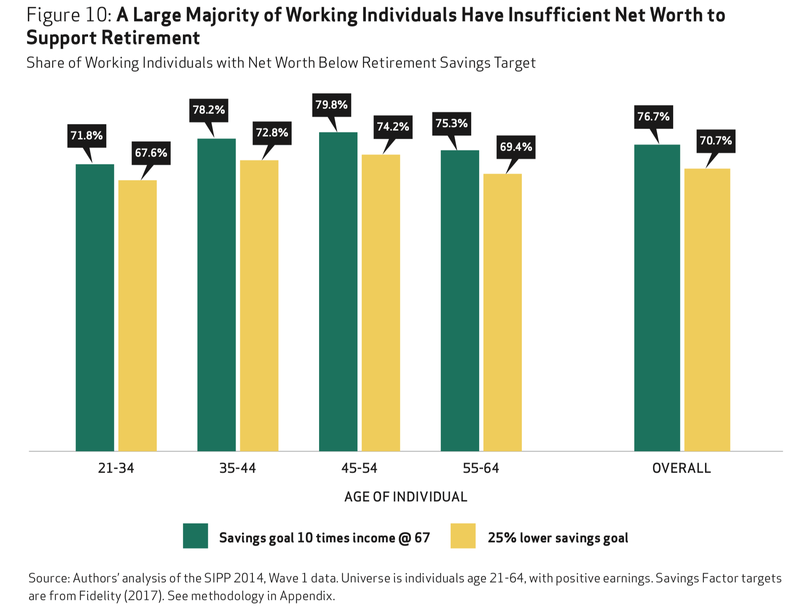 There’s no “fix” to the retirement predicament of the American workforce. There’s no policy change that can be made at this late date to reverse the decades of over-spending, over-indebtedness, and lack of saving. All we can do at this time is influence how we take our licks. Do we simply leave the masses of unprepared workers to their sad fate? Or do we share the pain across the entire populace by funding new social support programs via more taxes? Time will tell. But what we can bet on is tougher times ahead, especially for those with poor income prospects. So the smart strategy for the prudent investor is to prioritize building a portfolio of income streams in order to have sufficient dependable income for a sustainable retirement. Or for simply remaining afloat financially. Sadly, accustomed to the speculative approach marketed to us for so long by the financial industry, most investors are woefully under-educated in how to build a diversified portfolio of passive income streams (inflation-adjusting and tax-deferred whenever possible) over time. Those looking to get up to speed can read our recent report A Primer On Investing For Inflation-Adjusting Income, where we detail out the wide range of prevalent (and not-so-prevalent) solutions for today’s investors to consider when designing an income-generating portfolio. From bonds, to dividends (common and preferred), to real estate, to royalties — we explain each vehicle, how it can be used, and what the major benefits and risks are. And in the interim, make sure the wealth you have accumulated doesn’t disappear along with the bursting of the Everything Bubble. If you haven’t already read it yet, read our premium report from last week What To Do Now That ‘The Big One’ Is Here. This entry was posted in Debt, Economy, Governments, Investing, Pensions, Politics and tagged Retirement, Savings. Bookmark the permalink.